Imagine you’re not interested in collecting hotel loyalty points. Still, you want the pay the lowest price for your hotel bookings. What’s the minimum effort you should make before finalizing a hotel booking? Read it here! Despite the criticism, Tripadvisor is still a valuable resource for realistic pictures of hotels, practical info on how to get to a hotel using public transportation, where to find good restaurants, etc… Another great resource for this kind of information is frequent traveler community Flyertalk. If you google the name of a hotel and add Flyertalk to the search query, chances are pretty high it will return a Flyertalk thread with valuable info from travelers which have visited the hotel before. Same is valid for googling for blogger reviews of hotels. Finally, you can use KiwiCollection.com as a source of inspiration. They offer beautiful pictures of hotels and resorts around the globe. Lesson number 1, don’t book too early. Way too many people book hotels months in advance on non-refundable rates. This is definitely not a good idea, unless you’re absolutely sure you found an amazing deal. Once you have selected a few hotels, do some research on what rates people have paid in the past. You can find this info on Tripadvisor, Flyertalk, MilePoint, blog posts, etc… You can also make dummy bookings to see how prices compare closer to the arrival date. Personally, I scored the best deals by booking my hotels 2 to 3 weeks before arrival. Always use aggregator sites like HotelsCombined.com, Trivago.com and Kayak.com/Hotels to check hotel rates. These aggregators will verify hotel prices at +200 sites (incl. Hotels.com, Expedia, Ebookers, etc…) and show where you can book cheapest. Perform your search queries at both HotelsCombined and Trivago as some days HotelsCombined will find the lowest rates, other days Trivago might return the best prices. A few weeks ago, I published a separate article on last minute hotel booking apps. If you’re adventurous or have plans which might change last minute, these apps can provide you with some significant savings. See my article for more details. Hotels pay high commissions (up to 20%) to third party booking sites like booking.com to bring customers in. To attract direct bookings via the hotel’s own channels, they will often have promotions or discount codes available. Always check the hotel’s website, facebook page, twitter account, etc… for discount codes and promotions. Sign-up for newsletters of hotel chains and your preferred boutique/independent hotels. They often send out advanced notifications when they’re having a sale. There’re a number of promo codes and tricks available for the big hotel chains year-round. I’ll be publishing these in a separate series of articles in the coming weeks. 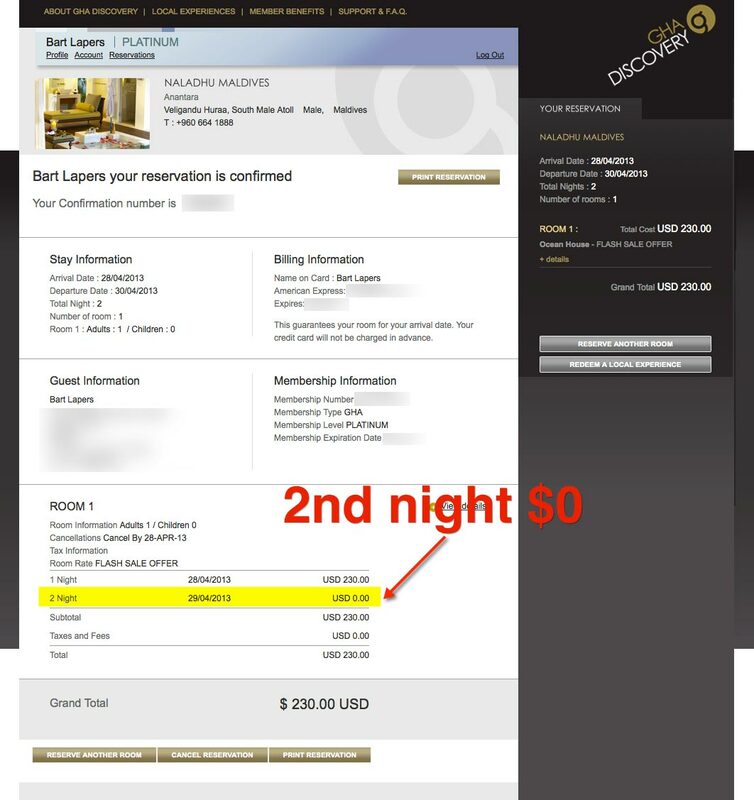 We all make mistakes and so do hotels and OTA’s (Online Travel Agents) now and then. Keeping track of these mistakes (and being flexible) can result in some amazing savings. 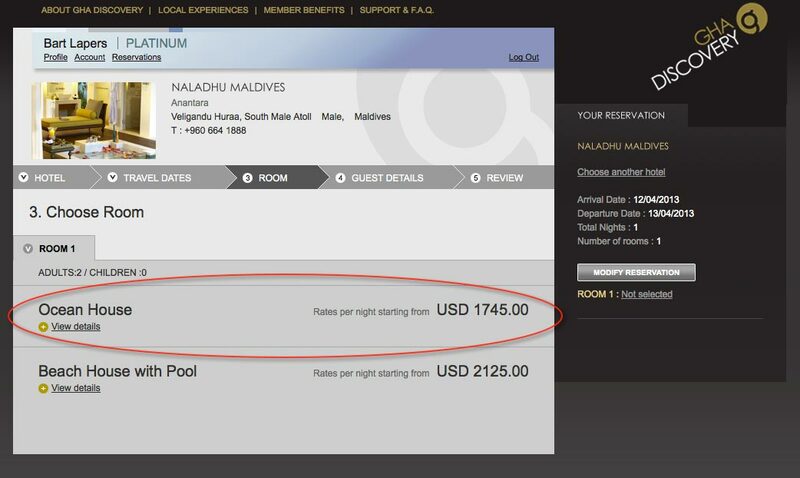 How about booking a private +100 sqm villa in the Maldives for $115 instead of $1745? Obviously, not all error rates are being ‘honored’, but sometimes, after some persistence, you might succeed. Keep track of hotel error rates by setting an email alert on this Flyertalk Hotel Deals thread or by keep an eye on my twitter feed. If there are no affordable hotel rooms available at your destination or if nothing suits your taste, there are alternatives like Airbnb.com (by using my referral link, you’ll get $25 (€22) discount on your first booking of $75 or more) If you don’t want to spend any money at all, there’s still Couchsurfing.org! Full disclosure: If you use my Airbnb referral link, I might receive referral credits. Thank you for your support! 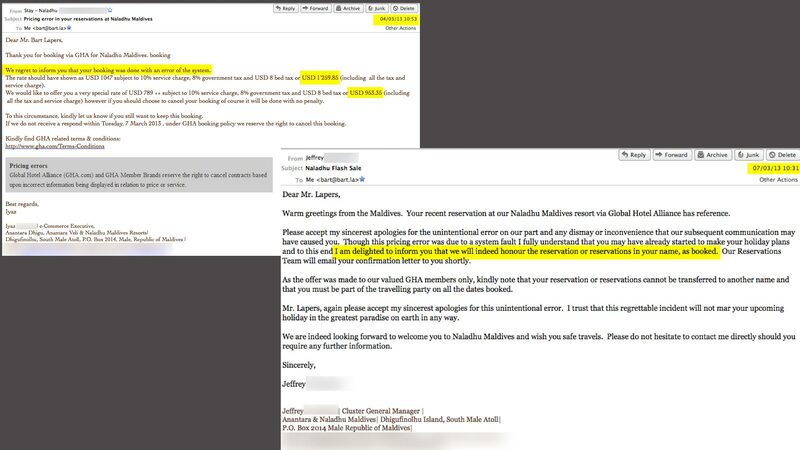 Hi Bart, I wonder if you still have your email on how you responded to the Maldive’s pricing error. I am in a similar situation and any guidance would be helpful. Thanks! – E-mail to the hotel / OTA (online travel agent). Don’t rage, but do say that you are disappointed and upset. In the bottom of the e-mail you must clearly point out what you require to get this issue resolved. You’re not just ventilating your frustrations, you’re communicating so they can reach out to you. – Depending on your demands, they may transfer the case to the hotel management itself. – Write an elaborate message on the Facebook page of the hotel / OTA about your issue. – If they agree with your arguments they are likely to restore the booking and honor the rate. Hi Bart, I just booked my first hotel at an error rate. Now, should I mail them myself? I have no reason to complain so I don’t really know what I would say. Thank! Hi Lisa, nope, no need to contact them. Just sit it out until your actual stay. Try to prepare a plan B in case the hotel would refuse to honor the rate at check-in. But in most cases, they’ll contact you in advance if they don’t want to honor it. Enjoy!